We offer personal protection training with your dog, or we have dogs for sale that may be perfect for your unique needs in Huntersville. Have you recently had a break-in and you no longer feel safe at home? Do you wish you had extra protection while you are away on business? At Dogs By Andy, we understand that sometimes your situation requires personal protection through unique resources. That is why we offer personal protection training with your dog, or we have dogs for sale that may be perfect for your unique needs in Huntersville, North Carolina. A dog that provides personal protection will certainly boost your confidence when you need to leave your home, car, valuables or children for any length of time. You may also feel more confident outdoors where you exercise, live, and work. The first step is ensuring that your dog is the right breed and temperament for personal protection training. Not every dog breed is well-suited; for example, if your dog lacks self confidence, is high anxiety, or is afraid of noises, you may have a great family pet, but not the best dog for personal protection. In this case, we may recommend one of our trained dogs for sale as an alternative. Additionally, you may be wondering whether the dog finds personal protection fulfilling. Dogs used for personal protection enjoy a number of benefits during this specialized training, including gaining confidence in their abilities, learning to use their natural instincts, and improved health and fitness. This training increases the dog’s bond with you, their owner, and you will feel better knowing you have the personal protection you require. If you are interested in learning more about personal protection training or our dogs for sale that already have this training, contact us at Dogs By Andy for more information. We look forward to talking with you. You will feel more confident in all of your activities in Mooresville when you have a pet that has gone through dog protection training. Do you feel that your dog might be a great candidate for dog protection training, but you aren’t sure where to begin? 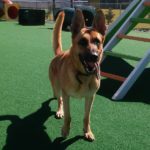 At Dogs By Andy K-9 Services, we provide personal protection training for dogs in the Huntersville, Charlotte, Concord, Gastonia, and Mooresville, North Carolina area, including Myers Park, Weddington, Ballantyne, and SouthPark.